Wailing to the Rafters Reviewed by Brooke Billick on March 29, 2019 . It’s almost like nothing you’ve ever seen or heard before. 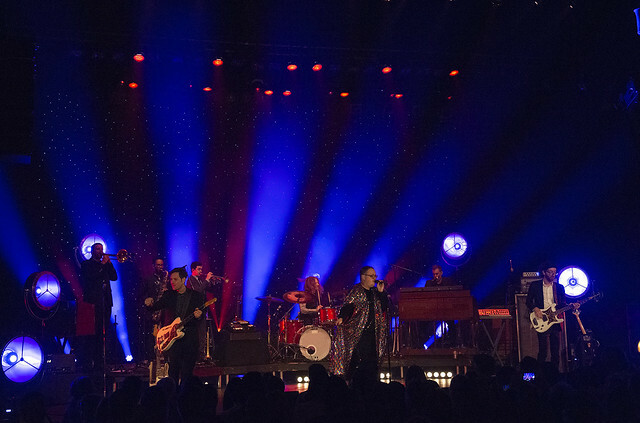 Going to a performance by St. Paul & the Broken Bones is, to say the least, an exuberant experience. 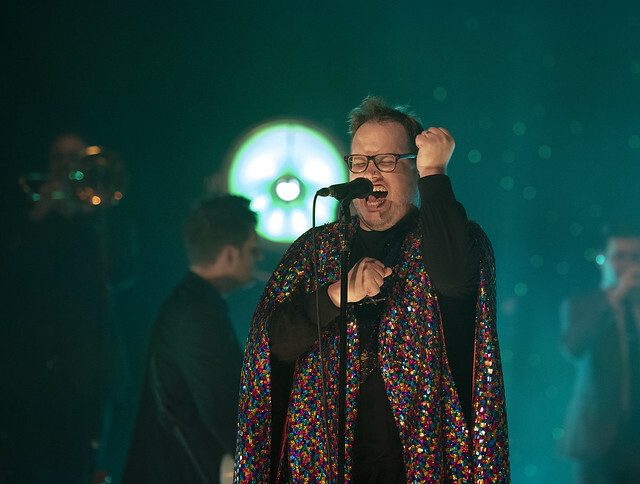 St. Paul & the Broken Bones performed at the historic Pabst Theater in Milwaukee, on Sunday, March 24, 2019 before a packed house of enthusiastic fans. Their performance was part of their Spring 2019 tour that will see them performing virtually non-stop through the Sea.Hear.Now Festival in New Jersey on September 22. 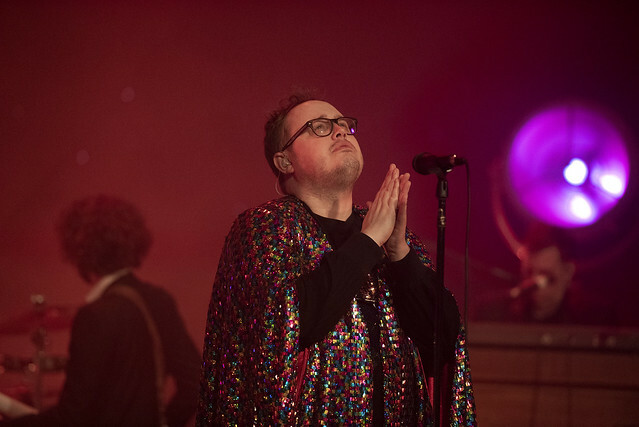 For those who have not followed the band’s meteoric rise in popularity, St. Paul & the Broken Bones is lead singer Paul Janeway (or would lead ‘wailer’ be more accurate? ), backed by a talented six-piece band. Paul hails from a rural hometown of Chelsea, Alabama and got his start singing church and gospel music as a young man. It’s been said that he began wailing straight out of the womb and hasn’t stopped since. Janeway formed his band in 2012 after it became apparent that he might not be best suited as a man of the cloth. Listening to Paul and the band, you appreciate the passion and fire he puts into his songs with distinct parallels to a church choir calling the faithful home. 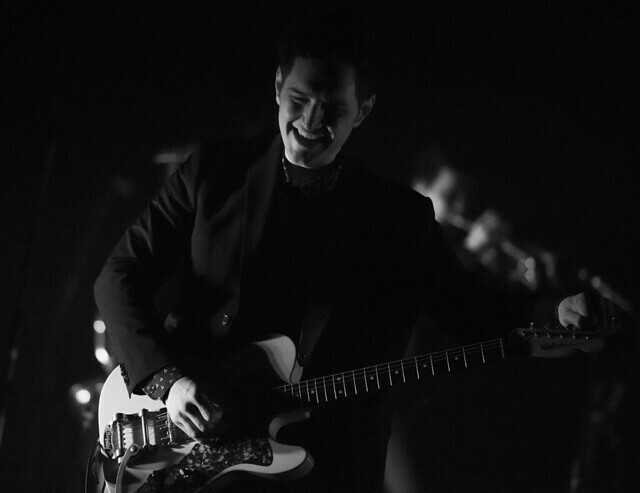 His music has been described in varied ways ranging from retro-tinged garage rock to classic R&B. To me, at times, his music feels like it’s the essence of soul, with a distinctly Southern charm. Inviting and welcoming, but with an undeniable depth and message underlying each song. Following an instrumental opening by his band with a foreshadowing of the frenetic energy to come, Paul Janeway virtually burst out onto the stage. 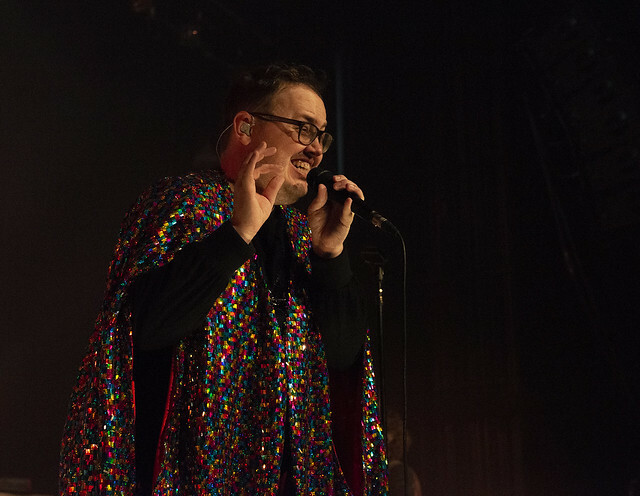 Foregoing the suit, tie and shiny gold shoes characteristic of the band’s earlier performances, Paul Janeway appeared with a swirl in his ankle-length red, blue and green sequined cape. Once he appeared, he never stopped moving—dancing along with the music and showing off his falsetto and wailing to the rafters as if he was singing to a higher power. 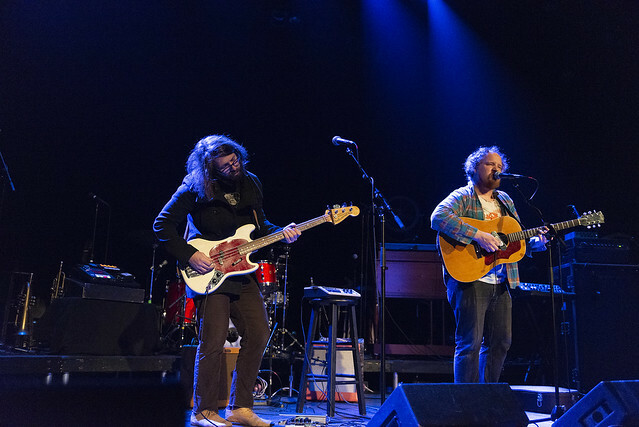 Most of the set consisted of songs from the band’s third album, Young Sick Camellia, released in the fall of 2018. That album was produced by industry veteran, Jack Splash, who is known for working with many modern soul artists. The album is a departure from the band’s earlier releases of pure R&B and soul and exemplifies Paul Janeway’s eagerness to take his music in a new direction. 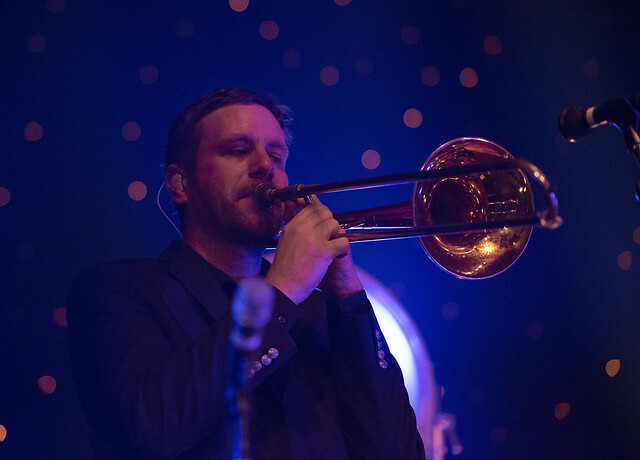 With support from horns and synthesizers, and a flood of focused and diffuse lighting, the set showed the willingness of Janeway and the band to go more into an experimental and almost psychedelic direction. During the show, Paul reminisced that his band’s first appearance in Milwaukee in November 2013 at Club Garibaldi—a night with about 40 in attendance. My first experience with St. Paul & the Broken Bones was at Summer Sounds Music Series in Cedarburg, Wisconsin in August 2014. I recalled a relatively unknown band (well, at least unknown to me) playing in the park in a free concert totally blowing away the crowd with its frenetic, high-energy and joyous funk and soul sound! The band was destined for great things—which came to fruition with their appearance on the David Letterman show a few months later, followed by a European tour and opening dates for the Rolling Stones’ summer tour in 2015. 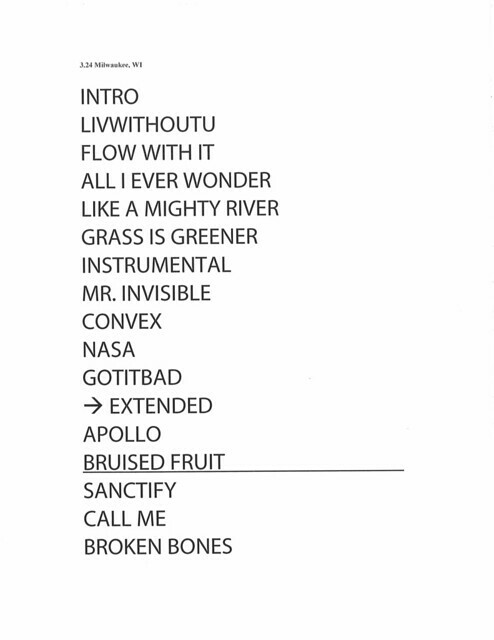 The band closed out the regular set with “Bruised Fruit.” The crowd, by that time standing on their feet, clearly wanted more. Their rousing applause brought Paul Janeway and the band back for an encore beginning with “Sanctify,” off of the Sea of Noise album. 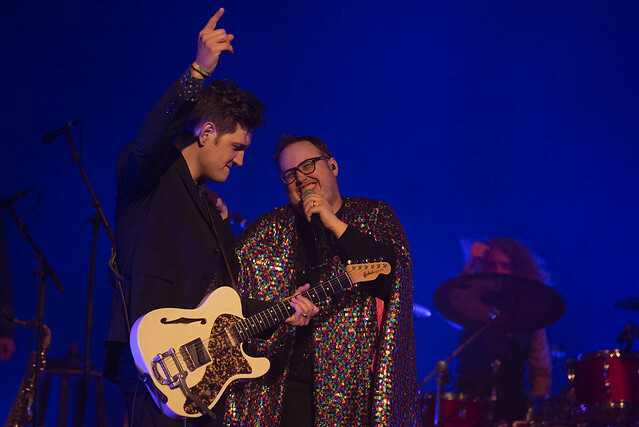 They concluded the show with two of their R&B standbys, “Call Me” and “Broken Bones,” from their highly acclaimed debut album, Half the City. 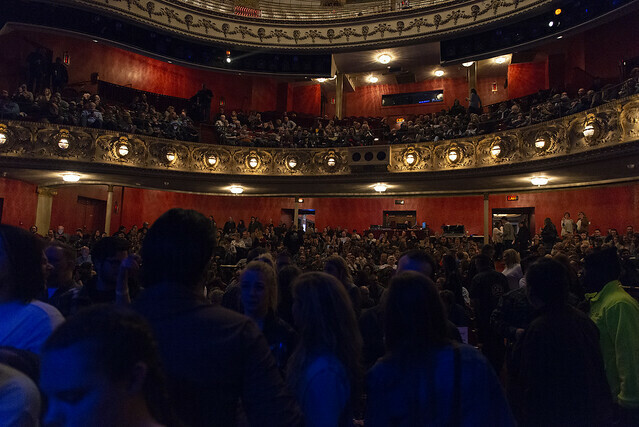 Paul Janeway shared the love with the crowd during his last song, “Broken Bones.” Janeway walked up one aisle into the Pabst lobby and up into the balcony serenading all along his route, before coming back down and returning to the stage. 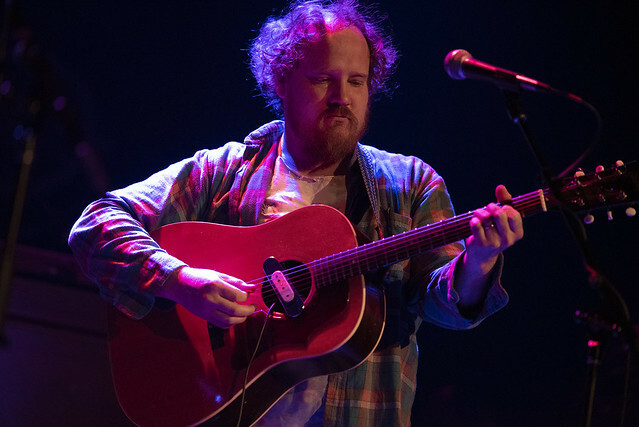 Michael Nau, a singer songwriter from Maryland, warmed up the crowd with a number of melodic and lyrical ballads. Nau displayed his a masterful instinct for arrangement that, combined with his reedy voice, had the upfront crowd in the pit swaying along with the music. 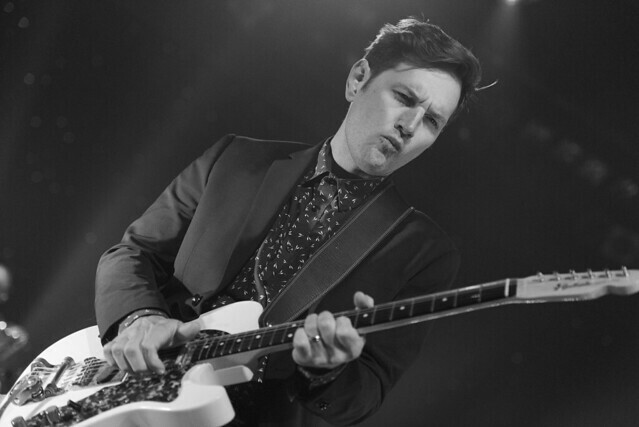 Vermont-based Benny Yurco, a member of Grace Potter and the Nocturnals, backed Nau up on the bass guitar. Paul Janeway has taken his band along for a wild ride as their music has grown and evolved over the last several years. He’s clearly not afraid to try new sounds and experiment with his music which may delight, or slightly dismay, his fans. For those who have not yet had the St. Paul experience, give his music a listen. For the ultimate treat, catch one their live shows. You definitely will be impressed! 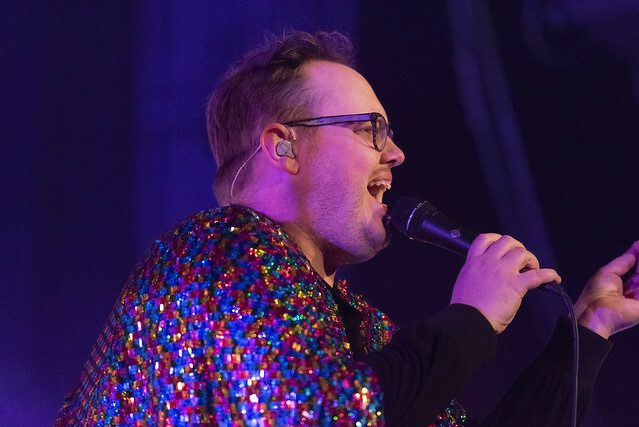 St. Paul & the Broken Bones have a few more U.S. tour dates before heading the Japan and Australia during April. After that, they head back to the states for an extended run into the fall. Click here for the band’s full tour schedule and tickets. Brooke Billick is based in Milwaukee. By day, he is a mutual fund securities lawyer dealing with scads and scads of arcane laws, regulations and requirements designed to ensure that client assets are handled and invested appropriately. He is almost always willing to help cure someone’s insomnia through careful and lengthy recitations of the intricacies of modern portfolio theory, dollar-cost averaging, supply side economics, the Oxford comma, and similar topics. By night, he happily haunts crowded bars, taverns and music venues featuring live music while pursuing that perfect artist profile or facial expression. Over the past 40 years, Brooke has been actively photographing everything from scenic landscapes and portraits (including his sons, who typically respond to a camera with their middle finger). He has covered singer-songwriters, bands, and music festivals for several years, and feels energized by the passion and talent of the performing artist. Facing the prospect of retirement from full-time employment head on, Brooke looks forward to expanding his photographic opportunities and takes to heart Tom Petty’s advice – “if you don’t run, you rust.” Brooke’s website is perpetually ‘under construction.’ Until that project is completed (probably after he retires), @brookebillickphotography.